Russia dwindled from its superpower status on the world stage following the dissolution of the Soviet Union in 1991. Ever since, Russia has been embroiled in a battle with the Western world to restore its global image as a superpower. On several fronts, Russia has been pursuing both domestic and foreign policies to restore its international presence to compete with the Western world. In international relations certain states exercise greater leverage than others, due to their exceptional power status. Such a distinction may arise through being labelled a ‘superpower’ which requires for a state to be resolute along four axes of power: military, economic, political, and cultural. In recent times, Russian strategy has been to bolster these sectors to reclaim its status as a global superpower, which was lost following the Cold War. To better understand how Russia plans to reclaim its superpower title, it’s worth individually exploring how Russia is solidifying its position on all four fronts. With a defence budget of $44.6 billion, Russia is second only to the USA in the list of most powerful militaries in the world. 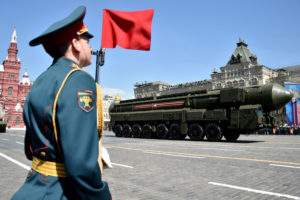 Russia has long maintained its image as a militarily advanced state, capable of protecting its interests both at home and abroad. Over the last few year, unrelenting Russian military efforts across the world have been making the case for Russia’s worthiness of superpower status. Russian involvement in Syria has been a contributing factor in exacerbating the ongoing civil war. Russia has equipped President Bashar Al Assad’s autocratic regime with new anti-aircraft missiles; just two weeks after a Russian aircraft was shot down. This rapidity displays Russia’s aptitude to adapt to world affairs to advance its militaristic ventures. This Russian expeditiousness has gradually been unnerving the western-led coalition, that is propping up forces against the Assad regime. As with the invasion of Crimea, Russian President Vladimir Putin demonstrated to the world Russia’s ability to advance personal goals by exercising military might. The hostile invasion of Ukraine was a signal to the western world that Russia will not be pressured by international condemnation or sanctions while protecting its interests. Following the events in Ukraine, Putin’s popularity picked up again showing public support in Putin’s vision to boost patriotism for the motherland. Stressing how under the leadership of Putin, a more aggressive militaristic approach is being accepted, to pave the way for the revival of Russian superpower status. According to US President Donald Trump, Germany is totally controlled by Russia because they’re getting between 60 to 70% energy from Russia. Though this figure may be inflated, Russia dominates gas imports in Europe through providing 37% of natural gas to the EU with $22.7 billion of monthly imports. Enjoying the largest amount of natural gas reserves in the world, Russia is able to generate substantial wealth from importing gas, keeping its competitors at bay. With Brexit in near view, Russia will seek to capitilise on the uncertainty, disruption and disorder it has been and will continue to cause. Russia will be able to seize the opportunity to use uncertainty from investors and businesses to create new business opportunities for themselves. As was seen with the allegations of Russian diplomats and even the Russian Ambassador influencing a key figure leading the Brexit campaign, with international business offers. The special counsel investigation into the alleged collusion of the Russian government to interfere in the 2016 presidential elections is ongoing with multiple guilty pleas, including the indictment of Trump’s former campaign manager and of 13 Russian nationals. This case of Russia’s blatant interference in foreign elections, with the goal of weakening the health and credibility of democratic regimes elucidates the Russian objective to clamber to the top of the international community. Russia can only succeed in becoming a great superpower if it creates a sense of hostility and disorder in the international community – which will pave its way to dominate on the world stage. In another show of political defiance, the Russian government has been found to ‘almost certainly’ orchestrated the poisoning of a former Russian military intelligence officer in the United Kingdom. The British Prime Minister Theresa May said that the perpetrators of the attack were from Russia’s military intelligence service, and likely approved at the senior state level. The expedition is one of insolence and gamesmanship as demonstrated by the Kremlin’s following actions. The Kremlin sought to sow discord in the UK by undermining the authorities, by flagrantly disobeying international law and simultaneously displaying the UK as weak and incompetent. The actions, however, provoked a huge international backlash with more than 100 Russian diplomats expelled from Western countries. Russia, nevertheless, maintained its staunch and aggressive stature by expelling diplomats from 23 countries all the while denying the allegations. What’s more is that Russia’s intelligence service allegedly attempted to target the Organisation for the Prevention of Chemical Weapons (OPCW) with a cyber attack. The OPCW is investigating the poisoning of the spy in Salisbury – highlighting Russia’s insistence to continue pushing its political agenda, using clandestine and hostile techniques. As with the other axes, Russia has escalated its quest for supremacy by supercharging its global PR campaign to restore its image to the outside world through displaying Russia’s cultural impact on the world. Distancing from its image as a hostile and autocratic state, the Russian government has spent billions of dollars to host major cultural events – despite them being mired with allegations of corruption. In 2018 Russia hosted the FIFA World Cup at a cost of somewhere between $26-30.8 billion, which Russian officials claimed would have a significant economic impact. Russia also hosted the Sochi Winter Olympics in 2014 in which new roads, railways, hotels and leisure facilities helped to attract more tourists. To keep up with western competitors Russia has been investing heavily into its cultural landscape through launching initiatives such as opening the first cultural institution in Russia specifically dedicated to design. Russian creativity and culture is publicised trough huge infrastructural project, such as the Moscow Metro which is Europe’s biggest mass transport system. As the world’s largest nation, Russian culture displays its diverse heritage through its architecture and colourful domes, ballet companies and nesting dolls – exhibiting to the outside world the deep-rooted cultural values of the Motherland. With a view of poking at the issues and insecurities of the western world, Russia is running a secret yet highly effective campaign to weaken its opponents and supplement its growth as a superpower. Though we exist under an anarchical system, the world is very much still governed by power politics, in which Russia is an integral force. With a permanent seat in the United Nations Security Council, Russia has a great deal of influence on the international community – and is only seeking to augment that presence. Russian economic, military, political and cultural policies are shaped to showcase to the international community the exceptional power Russia possesses to influence global affairs. Under Putin’s leadership Russia has found a renewed sense of patriotism and is increasing its velocity on all fronts to continue its efforts to once again take pole position at the world stage. With a view of poking at the issues and insecurities of the western world, Russia is running a secret yet highly effective campaign to weaken its opponents and supplement its growth as a superpower. The bold statesmanship of Putin is helping craft a new legacy for Russia to reclaim its status as a global superpower – and if continued to be unchallenged it may just become reality.